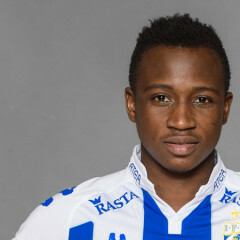 Prosper Kasim is a Ghanaian footballer who plays for Norrby IF, on loan from IFK Göteborg, as a winger. Kasim joined Inter Allies as a teenager where he played several games across all the forward lines in the Ghana Premier League between 2014 and 2015, becoming the Club’s talisman during that time. Mostly used for the youth team, the speedster made a couple of appearances for the senior side in his second season for the Swedish side. In January, 2017 he joined Norrby IF on loan. In 2015, Prosper Kasim was invited to the Black Satellites, the Ghana U-20 team during his time with Inter Allies. He played an integral role and helped the squd to qualify for African Youth Championships, during the tournament he was very vital. Kasim also featured in the FIFA U-20 World Cup in New Zealand later in the same year.